We are super happy to work with artist Andrea Kang on a new series of customs especially for NYCC! 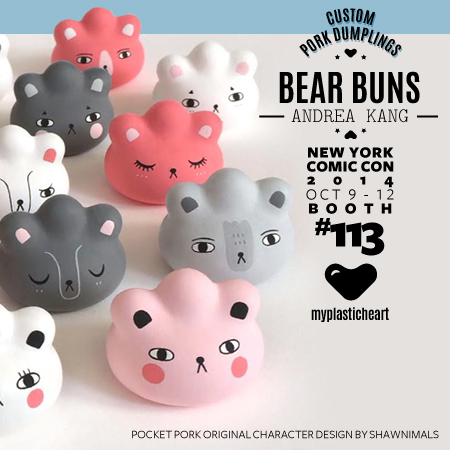 Dubbed Bear Buns, Andrea takes the popular Pocket Pork Dumpling platform by Shawnimals and give it her personal touch, creating a group of delectable looking bears full of personality… they are almost good enough to eat! Each Bear Bun is a unique one-of-a-kind design hand painted by Andrea. Come by the myplasticheart booth #113 throughout New York Comic Con and pick one up for $65 each before they’re all gone!